Women on Wings’ partner Grameena Vikas Kendram (GVK) runs a Regenerate the Environment, Society and Economy through Textiles program (RESET) which aims to create sustainable life, combat climate change and improve farming communities’ socio-economic conditions. Recently Germaine van Teefelen, a Dutch expert in logistics and supply chain, worked with the GVK team in Kadapa on how to scale RESET. 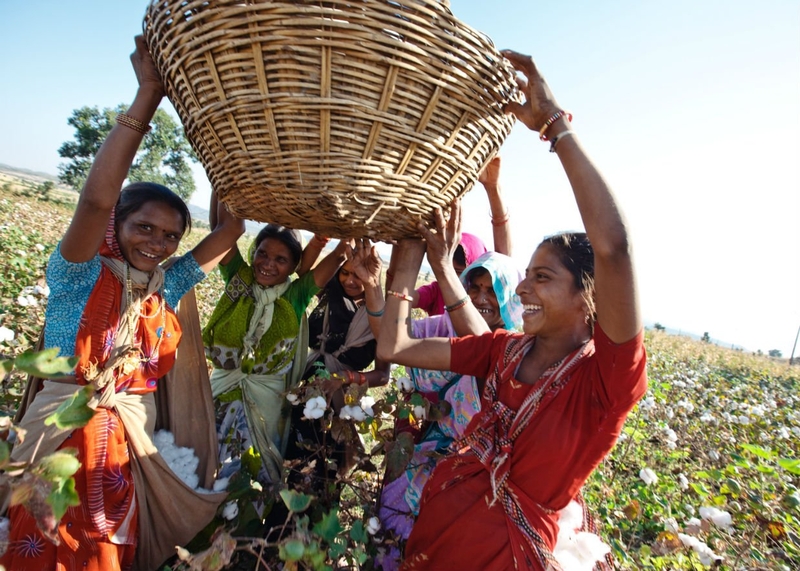 GVK supports – largely female – farmers to switch from conventional, pesticide-based farming to a regenerative-organic one that creates a win-win at different integration levels. RESET farmers are organized as producer groups and their capacities are built to take up collective cultivation, handling and sale. As the facilitating organization, GVK intervenes at the key leverage points across the supply chain to optimize value for the farming communities including value addition and up-marketing. While doing so, excessive carbon from the atmosphere gets captured to be buried into the soil. GVK is based in Kadapa, Andhra Pradesh. Next to its regenerative organic cotton programs, it works on a number of innovative models. Since 2016, Women on Wings and GVK partner to uplift rural communities by creating sustainable livelihoods for rural women. Initially, they only partnered in GVK’s Hesperidin program. Women gather and process sweet oranges that have fallen from the tree prematurely. These oranges contain Hesperidin, a bioflavonoid, which is a source for medicines. By enrolling the women into collecting and processing of waste fruits, GVK has already increased the farmers’ annual income by 15 to 20%.